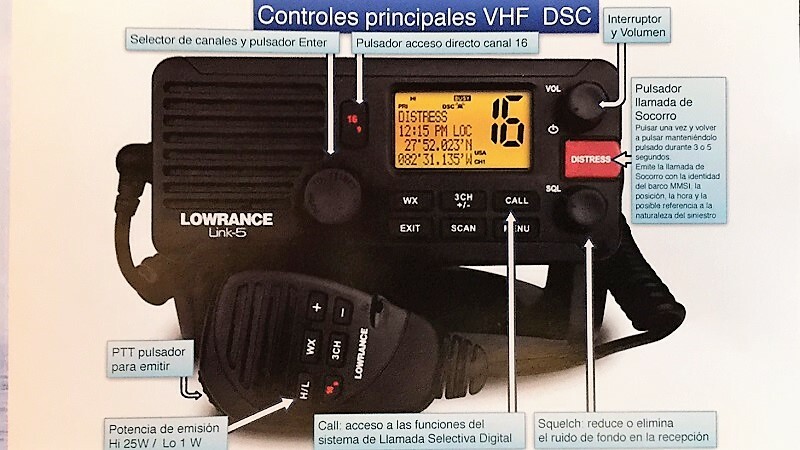 NAVEGANDO DEBE DE TENER LA RADIO VHF ENCENDIDA EN EL CANAL 16. CANAL DONDE LE INFORMARAN DE TODO AQUELLO QUE CONCIERNE A SU SEGURIDAD. SI SU RADIO DISPONE DE DOBLE ESCUCHA, ACTIVELO CON EL CANAL 16 Y SU CANAL DE CONVERSACION HABITUAL, 8, 62, 67, 69, 72 o 77. EL CANAL 9 LO USAREMOS EXCLUSIVAMENTE PARA COMUNICAR CON LOS PUERTOS DEPORTIVOS. EL CANAL 16 PARA LLAMADA DE SOCORRO. Y LOS CANALES 16, 10 Y 74 PARA SALVAMENTO MARITIMO. ANTES DE SALIR AL MAR CONSULTE EL PARTE METEOROLOGICO. IMPORTANTE, BARCO EN ORDEN Y COMBUSTIBLE QUE SOBRE.